When you come into the periodontal office for an examination, you might assume that the focus is on your teeth and gums. That's often correct — but don't forget that there are a number of other parts of the oral and facial anatomy that are examined as well. These include areas around and inside the mouth (such as the lips, cheeks, hard and soft palate, and the tongue) as well as outside the mouth (the skin, muscles and glands in the neck, and the temporomandibular joint). In fact, when it comes to detecting certain oral or systemic (whole-body) diseases, a thorough dental exam may be your first line of defense. How are diseases in the mouth discovered? You will be asked about any changes you have noticed, or symptoms you may be experiencing. Your face, mouth, and neck will then be visually inspected, and certain areas may be palpated (gently touched or pressed with fingers) or probed (touched with a small instrument). If needed, additional tests or diagnostic imaging (X-rays or other methods) may be used to aid in diagnosis. Occasionally, an abnormality such as a lesion (an unusual localized change in your tissues) is found that needs to be examined further. Lesions may resemble white spots, red spots, or lumps, but they are typically benign. However, it is often better to err on the side of caution and perform a biopsy to be sure. A biopsy is the removal of a piece of abnormal tissue from your oral cavity. This tissue is given to a pathologist for examination. The pathologist then prepares the tissue and examines the cells under a microscope in order to give a definitive diagnosis. The pattern on the tongue can change daily as the lesions appear to move or migrate, healing in one spot only to reappear in another. That's why the medical term for this condition is benign migratory glossitis. It's scary looking, but does not compromise a person's health. No one knows exactly what causes geographic tongue, but some factors that may play a role include vitiman B deficiency, irritation from alcohol or spicy foods, and genetics. 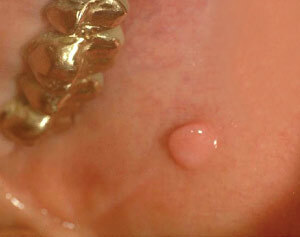 Fibroma - a thickened mass that may feel like a lump in the lining of the mouth. Leukoplakia - a condition that causes white patches to form inside the mouth. While usually benign, the lesions may be precancerous and are often biopsied. Lichen Planus - an inflammatory disease that sometimes causes discomfort. Mucous Membrane Pemphigoid - an autoimmune disease that may cause oral lesions, but is not life threatening. Pyogenic granuloma - benign red swellings that forms on gum tissue and bleeds easily. Any abnormal tissue (like lumps, non-healing sores, changes in color, etc.) found in your oral cavity that has persisted for more than 14 days and cannot be readily explained, should be biopsied to obtain a diagnosis. Although the majority of oral lesions are benign, if there is any possibility that the growth could be cancerous or pre-cancerous, it's likely that a biopsy will be performed. A biopsy is usually a simple in office procedure which requires only local anesthesia. If incisions are made, they are often closed with self-dissolving sutures (stitches) that don't need to be removed. If a laser is able to be used to obtain the tissue for a biobsy, then sutures are not required. Because the oral tissues are rich in blood vessels, some bleeding is normal for a period of time afterward. You will be given follow-up instructions as needed, including how to manage swelling and discomfort, when to take medication, and what to eat and drink. Getting some rest and maintaining good oral hygiene will also help you get back to normal as quickly as possible. When the pathology report is complete (usually in one week), you will be given the results. Rest with your head elevated when you arrive at home after the procedure. We ask that you please limit your physical activity and keep moving to a minimum for the first 24-hours. Please take anti-inflammatory medications (NSAIDs) to prevent inflammation, swelling, and pain. For as long as you need the NSAIDs , we suggest taking 400mg-800mg of Ibuprofen every six hours to reduce swelling and pain and quicken healing. DO NOT take more than 2400mg in a 24-hour period. If you experience excessive pain or discomfort, take the narcotic that has been prescribed to you. If you do not have one, please call our office and the doctor will call in a prescription to your pharmacy. Please take as directed along with the NSAID. If you’ve been prescribed an antibiotic, please take as directed. We ask that you finish the entire dosage. If any of the medications are causing you extreme nausea, itching, or a rash; discontinue its use and call our office immediately. For the next few days following your surgery, some minor oozing may occur and is no cause for alarm. Gently rinse your mouth out with iced water or iced tea (tea contains tannic acid which can help stop the bleeding). We ask that you refrain from smoking and drinking alcohol as these activities will interfere with blood clotting and healing of the surgical site. If your bleeding continues, apply pressure to the surgical site by pinching the area with a moistened piece of gauze for 20 minutes. If your bleeding is moderate to heavy and has continued for a few hours without stopping, please call our office immediately. When you arrive home after surgery, you may have something very soft to eat or cold to drink. In the evening on the day of your surgery, we recommend eating a soft, bland meal as this is usually the best way to help you feel better. For the first week, please do not eat anything hard or crunchy. When possible, we will place a bandage over the surgical area to help with your comfort. Please DO NOT brush the bandaged areas. If the bandage should become loose or fall out and you are comfortable, then continue to avoid brushing the surgical areas. If the surgical area is uncomfortable without the bandage, then please call our office so that we can place a new bandage over the area. Please continue your regular oral hygiene habits on all other areas in your mouth. Please use an antiseptic mouthwash at least once in the morning and once at night before bed until your next appointment with our office. You can also swab the bandaged area with a cotton swab dipped in an antiseptic mouthwash every morning, every night before bed, and after eating and drinking.